The Foreign Exchange isn't the greatest name for a hip-hop group. They never went platinum, never went jail, never been shot and you probably never heard their songs on the radio. What they do have is great music, thoughtful lyrics and an uplifting message. The story behind their name is simple, all of the beats you hear are produced by a man who goes by Nicolay. He was born and raised in the Netherlands and produced all of the beats for the first album from The Foreign Exchange overseas. He has, since, moved to South Carolina, which is much closer to where you'll find his other musical half Phonte, who is based in North Carolina. Phonte was once part of, the now defunct, hip-hop collective known as Little Brother. Now that you know the history, you should know that this Friday is my first chance to ever see The Foreign Exchange in person and I am incredibly excited. Our friends over at Knuckle Rumler are hosting Nicolay and Phonte at the ND and I think you should be there. It's a Friday night show, so (hopefully) you don't have to work the next morning. As of this moment, you can still get tickets for the discounted advance ticket price but I think today is the last day for that price so act quickly. Once you have your tickets, RSVP on F*c*book so your friends know. 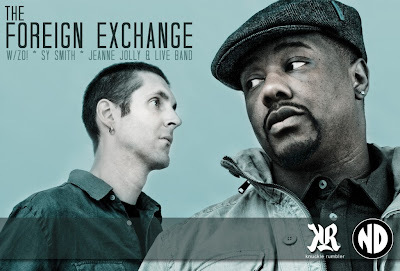 Sharing the bill with The Foreign Exchange at the ND Friday night, you'll find Zo!, Sy Smith and Jeanne Jolly. You can expect to hear these artists performing solo as well as with The Foreign Exchange. If, you've ever heard recordings of The Foreign Exchange then you know it's a collective sound, the whole idea of the project is to bring varying voices, styles and minds to one project. Also, did I mention they'll be performing with a live band? Because that's happening. Get your tickets now!